Zooming in from far away, the Nano Brothers take the wonderful world of music under the magnifying glass. Well-trained, but without choreography, they simply get started, and their power lies in real time. In front of the audience’s ears, they find beauty, abysses and, in doing so, reveal quite a lot about themselves. The way they play has proven to be very exciting and repeatedly elicits enthusiastic reactions from the audience. A conversation is always good when you can zoom in, without consciously realizing how something large can be pictured in ever smaller pieces. From the macro cosmos one enters the micro zone, and from there penetrates into nano worlds, each itself a new cosmos. Here, time does not matter because the seconds behave like years – it’s all a matter of deep experience. 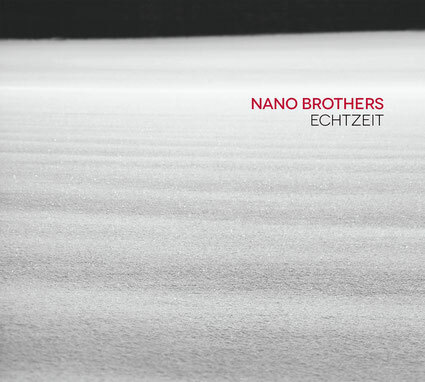 The first CD of the Nano Brothers Echtzeit [Real Time] acts just like this. The Nano Brothers are a duo from Cologne. Jürgen Friedrich plays the piano, Johannes Ludwig the saxophone. Both are masters of quiet dialogue and intuitively calculated detail. Thus, almost everything has already been said because everything else opens up from their playing. The two musicians enter into a conversation in which they let the listener participate. This conversation is as open-ended as a conversation between mother and child, as two old friends over a glass of beer or two twelve-year olds who, while playing, effortlessly take on the identity of their heroes. The music on Echtzeit is reminiscent of the nature of a fern leaf, which at first reveals itself to the eye in its overall shape. But just as one aims the zoom on the structure of each part of the leaf, one suddenly finds a thousand new miniature fern leaves and on and on. Jürgen Friedrich and Johannes Ludwig exchange in a dialog that spans a great narrative arc, and yet it is composed of countless melodic rich microelements, each of which has a narrative justification for itself. “Behind the logo of the Nano Brothers there is the maxim that we are working with tiny ideas and building Lego-like worlds from them,” Jürgen Friedrich explains how the duo works. The forces that hold all this together are repetition and variation. One adapts to these dialogues very quickly. The system, however, does not rely on the usual call-and-response formula that is drawn out in so-called free jazz which uses a sequence of solos, but each utterance is issued in the state of internalized listening. Friedrich and Ludwig ensnare each other with a delicate attention that leaves the listener enough space to share in their conversation with his or her own associations. The effect of this kind of musical conversation is that you can listen to this CD endlessly and penetrate into ever new levels of sensory perception and associative participation. Here, improvisation is not an end in itself, but is a necessity born from the spontaneous moment, one which also allows expressions that do not sound improvised. Friedrich and Ludwig do not, per se, come from freely improvised music, but rather open up more and more towards improvisation in front of a background filled with jazz and classical music, melody and harmony. That makes their music, in spite of all its abstraction, so tangible. Johannes Ludwig studied jazz saxophone in Nuremberg and jazz composition in Cologne. As a musician and composer, he transverses a wide musical spectrum, from contemporary jazz via pop to improvised music. He is active in various projects in Germany, especially with the Johannes Ludwig quartet, duos with the pianist Andreas Feith and with Jürgen Friedrich, with the band Jilman Zilman and with the Subway Jazz Orchestra. 2014 he and Jens Böckamp have been operating their own label, Float Music, where his current quartet album (CD Airbourne) and the duo album with Jürgen Friedrich have been released (CD Echtzeit). Jürgen Friedrich studied piano and composition at the Musikhochschule Köln and also spent a lot of time in New York City. He went on tour with Kenny Wheeler (CD Summerflood), toured Europe and the US with John Hébert and Tony Moreno (CD Pollock) and received great praise for his music for string orchestra and improvisers (CD Monosuite). As a founding member of the Cologne Contemporary Jazz Orchestra CCJO, Jürgen Friedrich has taken part in numerous premieres in Cologne’s Stadtgarten and in the WDR studios. His newest projects are Reboot with David Helm and Fabian Arends (CD Reboot) Nano Brothers with the Johannes Ludwig (CD Echtzeit), and Nautilus with Hayden Chisholm, Robert Lucaciu and Philipp Scholz. He teaches piano at the Musikhochschule Köln and manages the Master’s degree program for composition and arrangement at the Musikhochschule Mannheim. He has won the Gil Evans Award for Jazz Composition, the Jazz Prize of Lower Saxony, the sponsorship award of the city of Cologne for jazz and improvised music and the Composition Award of the New German Jazz Award.